Accessorize your lounge area with this versatile item. Perfect as a seat, footrest, or even table in the center of the room, this ottoman makes for a welcome addition to any area of your home. 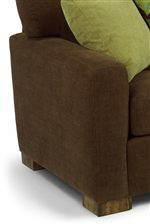 Its casual yet contemporary design features a plush, weltless cushion over block wood feet. Easy to move around the room as needed, you can't go wrong with this ottoman. Pair with its matching chair for head-to-toe comfort and coordinating style. 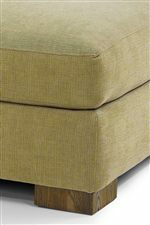 The Bryant Contemporary Ottoman with Block Wood Feet by Flexsteel at AHFA in the area. Product availability may vary. Contact us for the most current availability on this product. The Bryant collection is a great option if you are looking for furniture in the area.